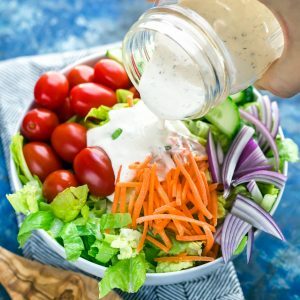 Ditch the sketchy processed bottled dressing and whip up this super quick, super easy, homemade paleo ranch dressing! Recipe yields six 2 TBSP servings. Place in fridge to chill + dive in when you're ready! The dressing can be made in advance and enjoyed for approx. 4 days. * For Whole30 simply make sure you're either making your own or using a compliant paleo mayo and you're good to go! If using fresh garlic vs. garlic powder, be sure to control the amount/bite of the garlic. I personally like to take the edge off by sautéing it in a teeny bit of oil or putting a drizzle of avocado/olive oil over the garlic and microwaving it for 20-30 seconds. You can always add more but can't subtract the garlic, so if using fresh start by adding a little and increase the amount to your liking. The ranch dressing I'm most fond of uses garlic powder so I'm super partial to using it in my ranch. If you'd like a thicker dressing (I like mine on the runnier side) you can use a bit more mayonnaise and less coconut milk, but if you're increasing the amounts beyond that you may have to tweak the seasoning to compensate so you don't wind up with a bland dressing. If you need tips shoot me a comment below and I'd be happy to make suggestions before you start experimenting!